Customize your trip with a local travel expert in Argentina. 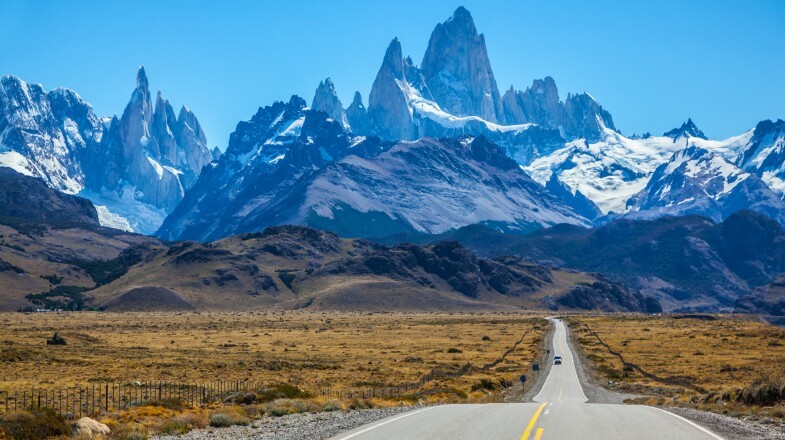 Sitting near the edge of the breathtaking Southern Ice Field, El Chalten and El Calafate are two famous Argentinian towns that are a definite not miss. The larger of the two towns, El Calafate is located just a stone’s throw away from the Los Glaciares National Park where the famous Perito Moreno Glacier lies. El Chalten is the sleepier mountain village that despite its small size packs a big punch. The gateway to Mt. Fitz Roy and Cerro Torres, two of the Patagonian Andes’ most rugged and impressive mountains, El Chalten is a hiker’s dream. The easiest way to travel to El Chalten is via El Calafate. Flights to El Calafate operate daily from most of Argentina’s major hubs, including Ushuaia and Buenos Aires. Upon arrival, travelers will need to arrange for a bus, shuttle or rental car to complete their journey to El Chalten. It is possible to bike the route; however, the 215-kilometer journey takes an average of two days to complete. Traveling by bus from El Calafate to El Chalten is the easiest and least expensive option. There are three companies that offer twice-daily service throughout the year (a third mid-day trip is often added for tourist season). The journey takes approximately three hours to complete and tickets cost USD 20 each way or USD 29* round trip. The buses are generally clean, comfortable and have bathroom facilities onboard. Buses leave from the main terminal in El Calafate, which is located on Julio Argentino Roca. Some of the buses also make stops at the airport. Make necessary enquiries if you want to head straight to El Chalten from the airport. The most reputable bus companies are Caltur, Chalten Travel and TAQSA. 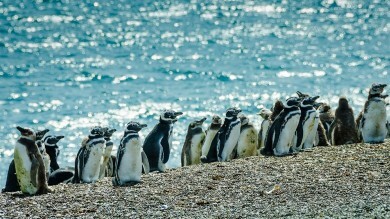 Off-season, buses depart from El Calafate and El Chalten twice each day 7:30 – 8:00 (depending on the company) and 18:00. During tourist season a mid-day trip runs at 13:00 from both cities. If you’re planning to visit in the high season, it is recommended that you book your tickets online in advance. Buses do not offer food and beverage services. Avoid going hungry on your journey by bringing snacks and water with you on board. For return journeys from El Chalten, Chalten Travel buses depart from Rancho Grande hostel, while Caltur buses leave from Hosteria Fitz Roy. Always confirm your point of departure with the company. If you’d prefer to travel the route on your own, the best option is to rent a car. This will allow you the freedom to complete the route as fast or slow as you want; however, it is significantly more expensive than traveling by bus. As with the bus above, the journey from El Calafate to El Chalten takes approximately three hours one way. The road is paved, well maintained and clearly marked, making the journey easy and straightforward. There are agencies in each city offering a myriad of vehicle options. Rates will depend on the car you select and the length of your rental. Book in advance to save more off your daily rate. Vehicles can be rented from agencies located at El Calafate Airport or in the city center. Rates vary depend on the length of your rental; however, you can expect to pay at least USD 40* per day. Renting a car is the best option if you are short on time or would like to see all of El Chalten’s most famous attractions within a day. Reputable rental companies in El Calafate include Hertz Argentina, Travel Rent a Car, and ON Rent a Car. Certain companies are not open on the weekend. To avoid paying any additional and unwanted fee, ensure you confirmed your pick-up and drop-off times before you arrive. To rent a car in Argentina, you will need a valid driver’s license, passport and be over the age of 25. The only pit stop along the route is the historic Estancia La Leona. Here you can pick-up a snack, water, coffee or simply hop out to stretch your legs. Private shuttles are a convenient, safe and easy way to travel between El Calafate and El Chalten. They allow travelers more flexibility over departure times, and to make additional and unscheduled stops along the way. The most luxurious and relaxing option, private shuttle transfers are also, unsurprisingly, more expensive than the regular bus. Tickets for a one-way journey typically start around USD 37* per person; however, prices vary depending on the services booked. Reputable companies offering private shuttle services include Walk Patagonia, Via Patagonia and Las Lengas. Depending on the size of your group, large or small buses, or SUVs are available. Pick-up can be arranged directly at the airport or from your accommodation in El Calafate. Semi-private transfers between El Calafate Airport and El Chalten run every two hours from the arrival of the first flight. Upon arrival at El Calafate Airport, proceed to the airport hall to meet your driver and begin your adventure. Guided tours are a great way to see the sights without any added stress. Book an all-day, all encompassing tour and be guided from El Calafate to El Chalten’s most famous attractions. If you’d prefer to arrive in El Chalten on your own, there are also many tour options highlight the regions top attraction. There are many ways to travel from El Calafate to El Chalten. Whether you prefer to go by bus, car, or via private shuttle or organized tour, if you enjoy hiking, nature, and breathtaking scenery, you must make the journey to this colourful mountain village. *Note: Prices are as of May 2018. Travelling to Argentina? Chat with a local travel specialist in Argentina who can help organize your trip.